Confederate Major General Sterling PriceIn March of 1982, Price commanded his Missouri troops as part of the Confederate forces at the Battle of Pea Ridge in Arkansas. The result was a Union victory that solidified control of Missouri for the United States. 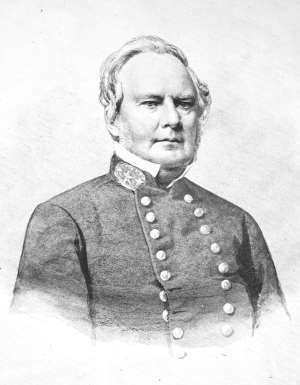 Later that year, Price and his Missouri troops were sent east of the Mississippi River to reinforce General Albert Sydney Johnston. Although they arrived to late to participate in the Battle of Shiloh, Price did lead his soldiers as part of the Confederate forces in the Second Battle of Corinth in October 1862. This too ended in defeat for the Confederacy.